Ciao from Pisa! 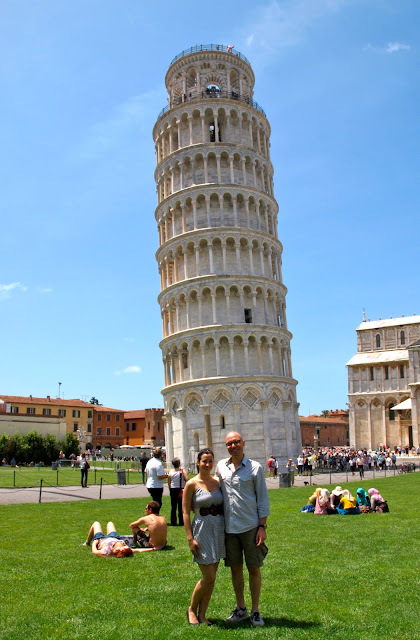 HD and I took a day trip to Pisa which is about an hour away from Florence by train. 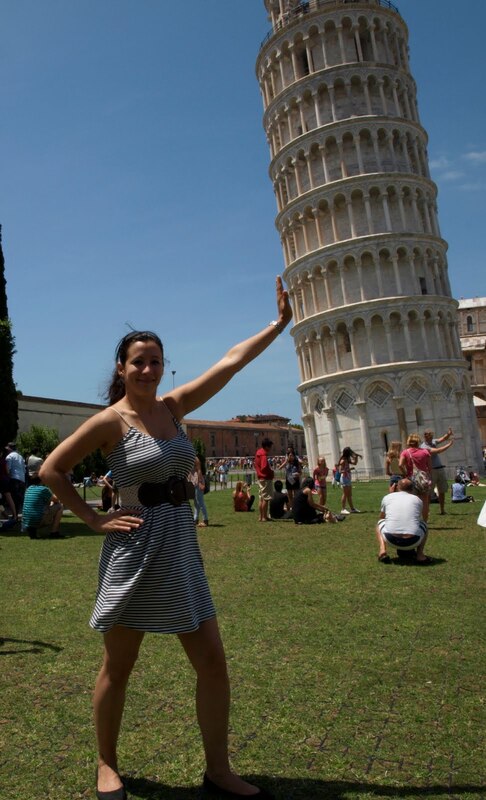 The Leaning Tower of Pisa or "La Torre Pendente" as it called in Italian. The tower was built between 1173 and 1372. and has eight floors which leans over at about 16 feet! The tower is built on unsuitable ground for such a heavy and tall building. It is only about 6 feet above sea level and built on a riverbed. The underlying ground is made up of layers of sand and clay. The layers are not even and the weight of the building has compressed them. Because the layers are not even, as the ground has compressed, it has sunk more in some places than others. Several plans have been tried over the years to stop the tower from falling. Some of them have been almost disastrous. In 1934 an Italian engineer drilled 361 holes into the base and filled them with mortar. The tower promptly leaned over some more. In 1993 650 tons of lead were hung from the North side of the building to try and stop the lean increasing. For a while it worked. In 1995, they decided to try and increase the foundations under the South side of the building. They froze the ground using liquid nitrogen, to stop it moving, and then started to remove stones, so they could insert metal rods. What they didn't know was that the stones they were removing were part of the original foundation of the building. That is the nearest the tower has come to disaster. In one night the lean increased as much as it normally increases in two years. They quickly added another 250 tons of lead and decided to rethink the whole thing. At this point everyone was just about ready to give up. Then a British engineering professor came up with yet another idea. His plan was to remove ground from under the high side, instead of trying to add ground under the low side. In 1999 work began, and was done very slowly, so that the building wouldn't get a sudden shock. At the beginning of June 2001, the work was complete, and the tower had been straightened up by about 16 inches, which returns it to the position it held in 1838. The engineers believe that it is safe for at least another 300 years. Cooking dinner in Florence. Two nights of lasagna and a very special bottle of Miani! A few nights ago I decided to cook a nice dinner for HD and I. I was inspired to make lasagna because I see it on almost every restaurant menu in Florence. I am always hesitant to order it because I feel it is so Americanized (I blame Garfield comics). The joy about lasagna is that there is always leftovers and we had plenty to devour for two nights in a row! I would also like to apologize that this post is NOT really a recipe. My Sicilian mother never used recipes. It is always add some more of that or not too much of this. It our household we used what we had and improvised if we didn’t have it. First I chopped up some garlic, an onion, half a carrot, a few stalks of celery, and diced up some pancetta. I tossed it in a hot pan with some olive oil. I sauteed it for about five minutes and added chopped beef and a can of tomatoes. In a separate bowl I added fresh ricotta and seasoned it with salt, pepper, and oregano. While I was prepping the ingredients I had added dried lasagna sheets to a pot of salted boiling water. I also sliced up fresh mozzarella cheese and grated some grana padano. 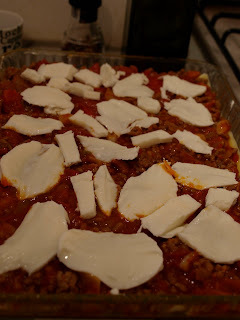 I began to alternate the ricotta and meat between layers of the cooked lasagna sheets. I also added some mozzarella with the meat layers. I topped it off with a final layer of sauce, mozzarella, and grana padano cheese. I baked it for about 45 mins at 350 degrees. I saved the best for last. The wines! The first night we enjoyed Bucci Tenuta Pongelli (Rosso Piceno DOC) 2008. 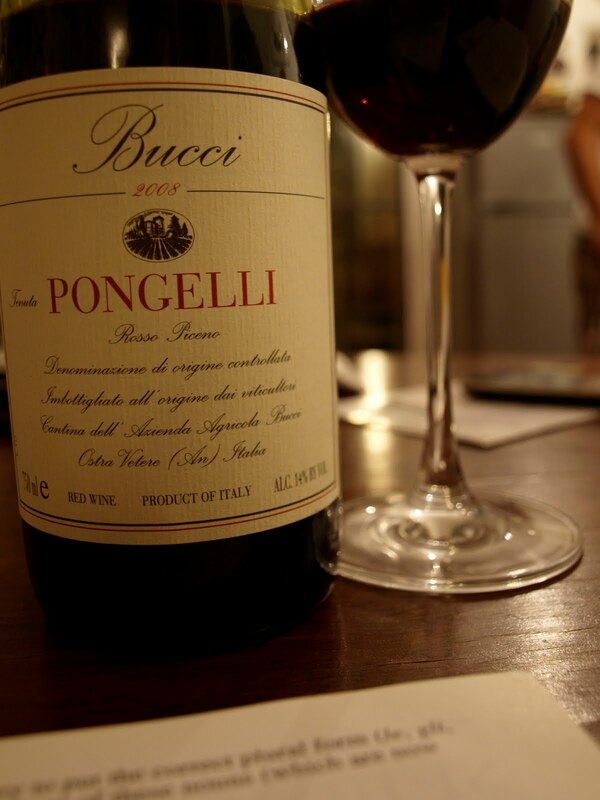 A blend of Montepulciano and Sangiovese grapes this wine paired nicely with the acidity of the tomato based meat sauce. Herbaceous with supple fruit, this wine from the Marche region was a nice wine to enjoy our meal on the first night. 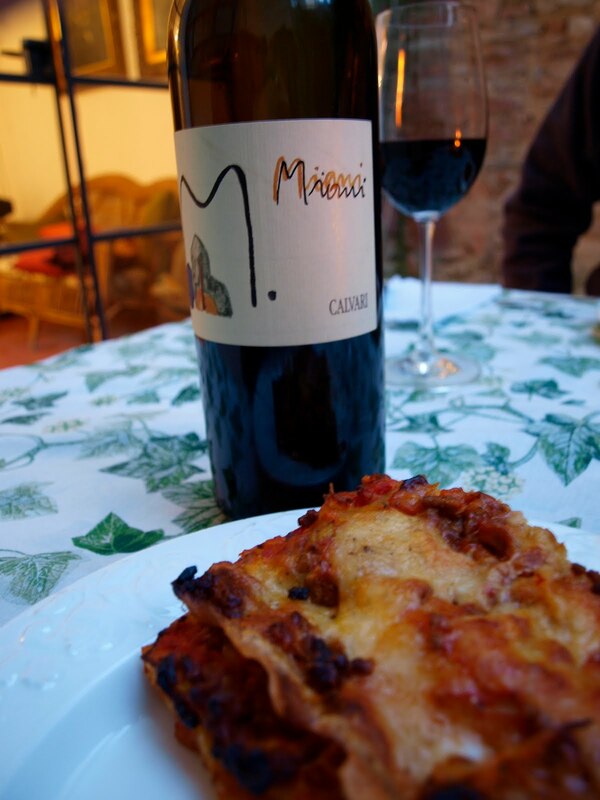 On the second night we stepped it up with the 2006 Miani, Calvari, from the region of Friuli Venezia Giulia. This rare gem is 100% refosco. Big and powerful with smoked meat, clove, graphite and dark cherries. Only two barrels are produced from these pre-world war II parcels which makes it a very special treat. One of my top wines this year! 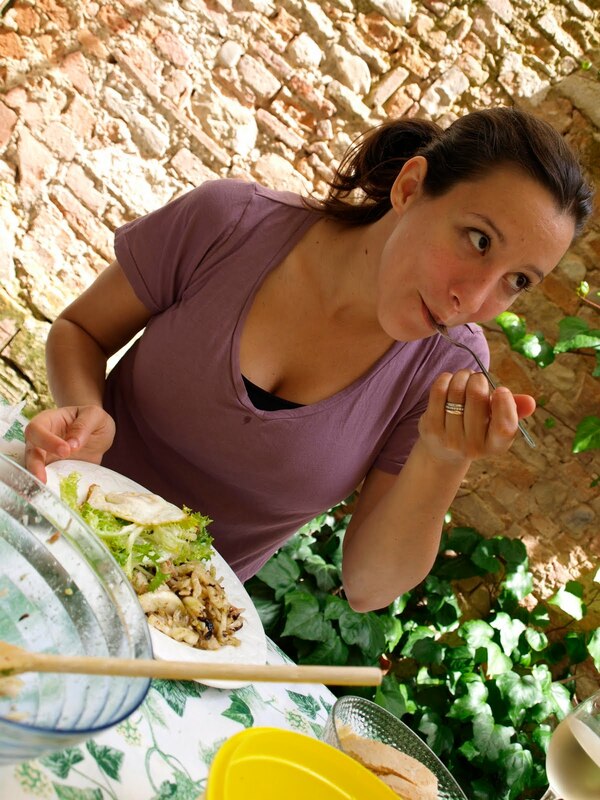 Lunch at home in Florence. HD salad is Frisee with eggs over medium, pancetta, and lemon vinaigrette. 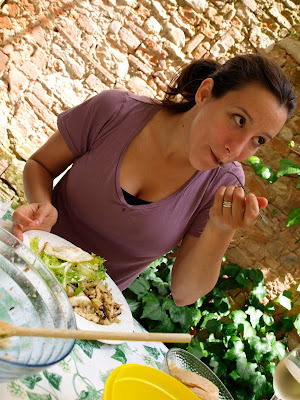 Mine consisted of shaved fennel, black olives, cooked tuna, lemon juice, and extra virgin olive oil. It was simple, cheap, and delicious. We polished it off with a glass of unoaked Verdicchio for me and a beer for HD. Sono una studentessa. I am a student. After I study I am unable to reward myself with the sights of this great city (città) because for the last few days it has rained very hard and hailed. (Yep, I wrote that it hailed.) On top of that the forecast calls for rain into the middle of next week. The word for rain is pioggia and I find it to be my least favorite Italian word. Hopefully the rain stops and I can go out and find some new adventures that I can post for you. Until than, I have to go back to my homework! Ciao!